Welcome to the Have Yourself a Cozy Little Christmas Event, brought to you by Cheap Is The *New* Classy. 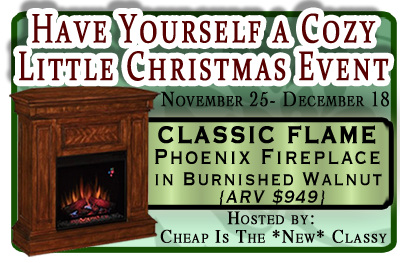 This event will end on December 18th and one very lucky individual will win an awesome Classic Flame Phoenix Fireplace in Burnished Walnut to keep you cozy this Christmas. But you can't win if you don't enter! Be sure to come back daily for extra entries! Good luck! a Rafflecopter giveaway Disclaimer: Cheap Is The *New* Classy and the #CozyChristmas bloggers are not responsible for prize shipment and/or delivery. I learned that it can support a TV up to a 150lbs...pretty cool! I love that the corner piece is weight bearing, making it strong enough to support a TV up to 150 lbs. I just got my husband a tv for Christmas and this would be perfect since we have nothing to set it on right now.